Back in the 1990s, HP revolutionized the printer industry with the first printers that could print in color, and today it’s hoping to do the same with 3D printing, introducing it first 3D printers that can produce prototypes and functional parts in full-color. In a briefing with analysts, Stephan Nigro, president of HP Inc.’s 3D Printing Business, introduced HP’s first full-color 3D printers, which represent HP’s next step in 3D printing, and which consist of four new full-color printers that complement HP’s existing 3D printers for manufacturing. The new 3D printers are billed as the industry’s first 3D printers to enable manufacturers to produce engineering-grade, functional parts in full color, black, or white, with control at the voxel level, in a fraction of the time of other solutions. The new 3D printers also feature a lower price point, ranging in price from approximately $50,000 to $100,000. “We are driving a lower price point to bring 3D printing to more customers,” said HP’s Nigro. § HP Jet Fusion 340 (Black and White) / 380 (Color) for customers who have smaller part-size needs or who commonly print fewer parts per build. § HP Jet Fusion 540 (Black and White) / 580 (Color) with a bigger build size than the 300 series for customers who have larger part-size needs or heavier production demands. The new 3D printers feature object build sizes of up to 7.5″ x 13.1″ x 9.8″, 0.08mm layer thickness, and can produce 52 parts in 15 hours. Target customers includes R&D teams, design firms, customized part manufacturers, manufacturing support teams, and universities, for producing healthcare items such as casts and surgical guides; artwork, collectibles, and jewelry; visual aids and models; and manufacturing parts. The new lower-cost 3D printers are part of HP’s campaign to “democratize” 3D printing for design, prototyping, and parts-production, with the lower price points making them more accessible to more customers. As HP’s Nigro notes, HP “wants to change how the world designs and manufacturers,” as part of ushering in the Fourth Industrial Revolution of artificial intelligence, industrial Internet of Things, Big Data and analytics, robotics, and, of course, 3D printing. “We’ll bring 3D printing to designers for prototyping, with the same technology used by (HP) 3D printing for production. This will be a fundamental shift,” said HP’s Nigro. HP’s goal for its 3D printers is to replace complex assembly made with injection molding with one 3D-printed part that requires no tooling or assets to manage, which will drastically reduce costs for manufacturers. The company is targeting the $12 trillion manufacturing sector with its 3D printers. Although 3D printing represents only a tiny fraction of that market today, it’s projected to grow at compound annual growth rate (CAGR) of 30 percent over the next five years. HP sees that in order for 3D printing to grow, it needs better product capabilities, lower materials’ costs, and more materials, as well as industry standards and policies. For its own part in the 3D-printer market, HP shipped its first 3D printers for prototyping and manufacturing in 2016, but really began selling its 3D printers in earnest in May 2017. Today it has over 65 resellers. It also today announced a new partner program that provides new HP back-end support to help recruit new resellers to sell HP printers. The HP Jet Fusion 300 / 500 3D printers are launching with a new material, HP 3D High Reusability CB PA 12. Parts using this material will have mechanical properties similar to the HP 3D High Reusability PA 12 material from HP’s industrial solutions. Leveraging HP’s Open Platform for materials and applications development, HP says it’s growing its materials ecosystem to grow its material range and reduce costs down. It says the Jet Fusion 300/500 series will ultimately support similar materials as the Jet Fusion 3200/4200/4210, and also support unique materials that enable color or other voxel-level capabilities. The HP Jet Fusion 300/500 series of 3D printers is available for order today and will begin shipping in the second half of 2018. 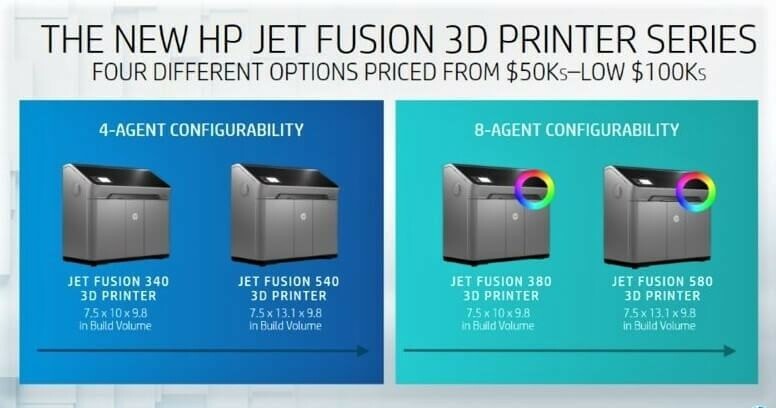 According to Ramon Pastor, general manager of Multi Jet Fusion 3D Printing at HP Inc., the new HP Jet Fusion 300 and 500 series 3D printers will enable customers to produce parts with intricate details – at the voxel level (a tiny unit of measurement similar to a pixel) in full color, black, or white, using a cyan, magenta, yellow, black (CYMK) and white palette. “We will drive totally unique applications with our full-color 3D printing at the voxel level,” said Ramon. One of the difference between the new full-color 3D printers and HP’s existing 3D industrial 3D printers, is that HP’s existing 3D printers for industry have higher duty cycles and are geared more for production, while the newer 3D printers are positioned for designing and prototyping, with some light production. They also feature lower price points, making them more accessible to newer customers. According to Ramon, HP leveraged its 2D-printing color printing in creating its 3D color printers. “We can define each voxel…we can define which voxel is CYMK or white.” In the future, he says HP is looking at changing other characteristics of the voxel – including each voxel’s electrical conductivity, elasticity, and more. HP also established its open 3D materials platform to recruit partners and developers to help develop new 3D-printing materials. HP’s new 3D-printer program is designed to expand its list of over 65 resellers by providing resellers with HP back-end service support. “We’ll make it much easier for partners to sell 3D printers, with HP providing more support,” says HP’s Nigro. 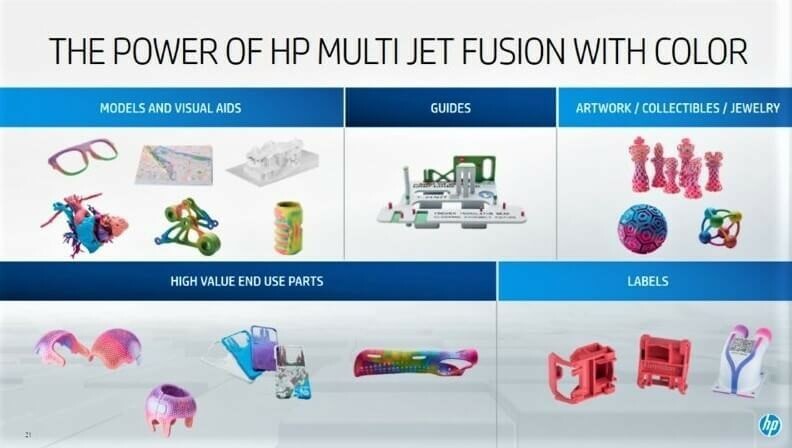 The HP Partner First 3D Printing Specialization program includes a variety of new options provided to partners selling HP’s Jet Fusion 3D printing solutions. As HP continues to increase its market reach and builds out its global market structure, it says it’s now enabling solutions providers with specific manufacturing industry expertise, global digital transformation, and IT solutions expertise to deliver Multi Jet Fusion technology for customers around the world. HP today also unveiled a new collaboration with Dassault Systèmes, a leading provider of 3D-design software with millions of users in more than 140 countries, to empower a new era of product design innovation by entrepreneurs, makers, students, and businesses. The two companies intend to optimize Dassault Systèmes’ industry-leading SOLIDWORKS 3D design and engineering applications to take advantage of the unique voxel-level capabilities of HP’s Multi Jet Fusion 3D printing solutions. 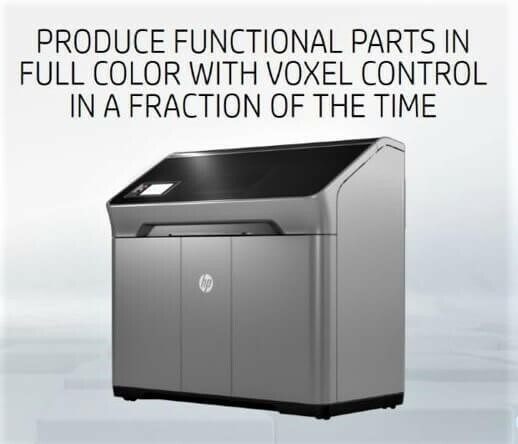 For more information and complete specifications on the new 3D printers, visit HP here.